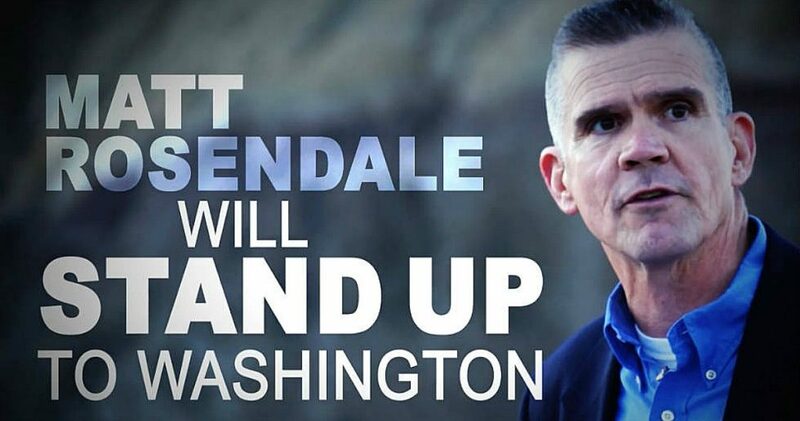 I’m in Montana with the Conservative Campaign Committee campaigning for Matt Rosendale, Republican US Senate. Along with standard campaigning techniques like TV and radio ads, social media and phone-from-home, our executive director Joe Wierzbicki is a strong believer in the low-tech activity of sign waving. Joe believes live bodies on street corners enthusiastically waving signs supporting our Republican candidates is extremely powerful. A few days ago during our sign-wave, a large number of Montana motorists drove by honking their horns in support of Rosendale. Montanan, Eric Olsen brought volunteers to join our CCC team for that sign-wave at a busy intersection. Eric is State Director heading up the Faith and Freedom Coalition’s initiative to distribute 50,000 Matt Rosendale door-hangers across the state. Eric is also president of Schlafly Eagles State, co-founder of Montana Shrugged Tea Party and director of Schlafly Eagles Constitution Center. I consider Eric my patriot brother. Folks, there is something really cool about meeting and having fellowship with Americans who love their country, desire the best for all Americans and love the direction Trump is taking our country. It is the same unifying message causing masses of Americans to show up a day and a half early for Trump rallies. Trump rallies are about uniting Americans rather than the divisive everyone-is-a-victim garbage promoted by Democrats. Hanging with Eric and his crew reminded me of how I felt back in the days of the Tea Party movement. I attended over 500 rallies on numerous national bus tours. While I was among only a handful of blacks attending the rallies, I always felt like I was with family, united in our love for our country. We were concerned about Obama’s desire to transform our nation away from the divinely inspired vision of our Founding Fathers – driving us down the road to socialism. The Tea Party movement had nothing, I repeat nothing, to do with Obama’s skin-color as despicably portrayed by fake news media. Volunteers Eric brought to our Rosendale sign-wave included extremely bright twenty-something-year-old Mark S. Mark is a recent college grad who is conservative and strongly pro-life. I asked Mark how he escaped being seduced to the dark side of liberalism. Mark replied, his faith-centered college and his strong Christian conservative parents. Conservative media is finally accurately describing the Democratic Party ‘mob’ which is breaking laws, slandering and physically beating up Americans –wrecking havoc in our streets; anarchy. Democrats have become so immoral that they will seek to brand every Conservative or Republican who runs for political office a sexual predator and worse. Fueled by hate for God and country, the Democratic Party mob forced local Democrat leader, Mark Salvas, to resign because of his pro-America and pro-Christianity Facebook post, “I Stand for the flag, I Kneel at the Cross.” Salvas is a Gulf War vet. Facebook called Salvas’s post, offensive. https://bit.ly/2RQKKph This is the evil we are up against folks. Fake news media is totally committed to rejecting truth, promoting lies and embarrassing/getting rid of Trump. A DNA test said Democrat Elizabeth Warren is only 1/1024th Native American which is less than most Americans. And yet, a reporter yelled at Trump asking him when he was going to pay Warren a million dollars for being wrong about her being an Indian. In the fake news media’s Twilight Zone, facts and truth do not matter. If Hillary had won the presidency in 2016, our economy would not be enjoying an unprecedented 7,000,000 available jobs. If the GOP loses the house or senate in a few weeks, Trump’s victories for We the People will be dismantled, immediately reversing course toward Hillary’s America; a very, very, very scary place – lions, tigers and bears – oh my! Democrats and leftists are pulling out the stops, leaving no dirty trick untried to block efforts to keep the GOP in control of Congress. In essence, keeping Trump in the White House. To save money, if the hotel has an outside grill, CCC team member (Grill Master) Donald grills dinner for our team. My wife Mary serves as Donald’s sous-chef. When we were in Montana a few months ago, Eric Olsen brought volunteers to one of our sign-waves. Afterward, we invited Eric and his crew back to our hotel for dinner grilled by Donald. Eric took a plate of food home to his wife. Donald liked that. He loves people loving his cooking.